Specialists in 20th century Russian Paintings and sculpture. A Preliminary catalogue of The Kentucky Portrait Gallery at the J.B. Speed Museum, Louisville, Kentucky, USA, 1949, No. 29, "Miss Mary Flexner(1873 - 1947)", by Serge Konetkov(sic), Bronze in high relief, Signed 'S.L. 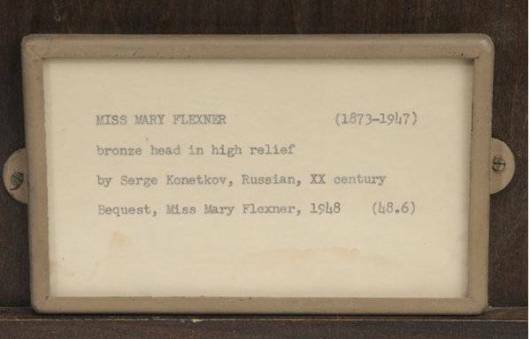 Konetkov', Bequest, Miss Mary Flexner, 1948(Inventory No. 48.6). 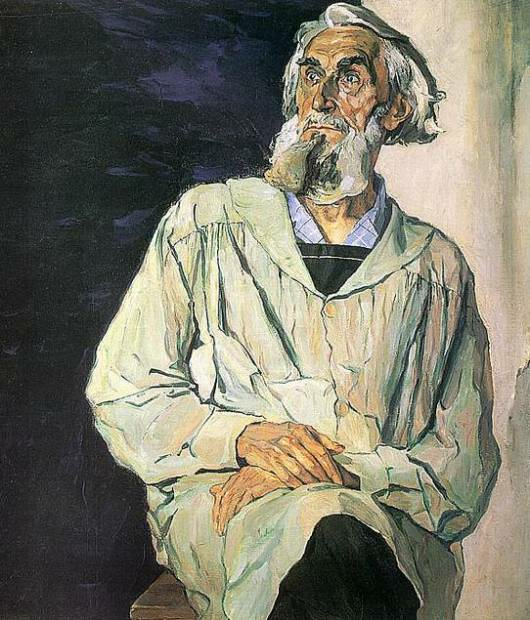 Sergei Konenkov by Pavel Korin, 1947, Tretyakov Gallery. Sergei Konenkov sculpted this portrait of Mary Flexner whilst in lonely exile in the USA before his return in 1945. Konenkov largely survived during his period in the USA by making such portraits and they are now considered an important part of his oeuvre. Despite the best efforts of his wife, and some early successes Konenkov never learnt good English and passionately missed Russia. However, reports of the time say that despite his poor English he had charm and wit, found ways of communicating and was a gracious and friendly host. He continued his studies into mystical cosmologies, science and the earthy wisdom contained in folk mythology. Konenkov's wife, Margarita, developed a friendship with Einstein, and there have been rumours ever since that she may been spying for the USSR. Mary Flexner and her brother Bernard(1882 - 1946) were important benefactors and philanthropists. Mary kept her a lower profile whilst Bernard became a prominent New York Lawyer and was one of the founders of the Council on Foreign Relations. His papers are held in the Seeley G. Mudd manuscript library at Princeton University. Mary Flexner, in her later years, is depicted in bronze looking to her left. The modelling is sure and Konenkov captures the spirit of this clever and spirited woman who never married and devoted her life to philanthropy and helping causes she believed in. Mary Flexner was introduced to Konenkov by her eldest brother, the famous Doctor, Simon Flexner, who Konenkov sculpted in 1925(the bronze bust is now held at the Rockefeller University in New York City). Simon Flexner was the first director of the Rockefeller Institute for Medical Research (1901 - 1935) and he introduced Konenkov to numerous commissions and clients. 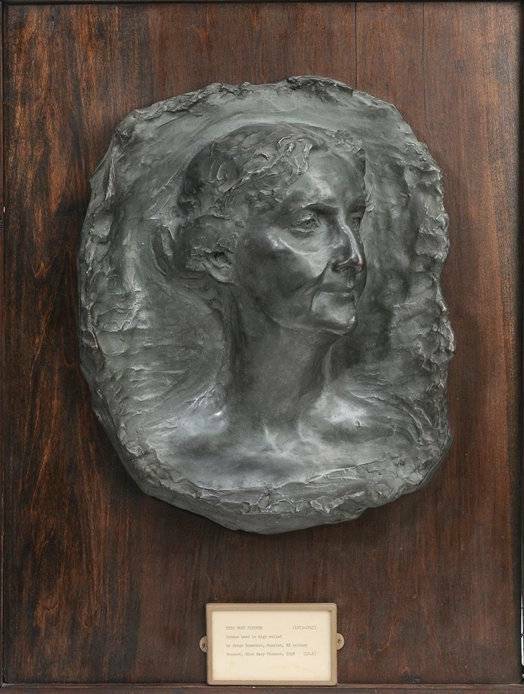 Mary Flexner left the bronze in her will to the Kentucky Portrait Gallery at the J.B. Speed Art Museum in Louisville, Kentucky where it remained until sold by them in 2013. Konenkov was born in into a peasant family in the remote backwoods village of Karakovichi in Smolensk province. Years later the artist recalled that he grew up among strong working men and women such as farmers, lumberjacks, raftsmen, masons and farm girls and that he had never seen himself as anything but a man who worked with his hands. Much of his early and late work(after his return to Russia at Stalin's request in 1945) is now kept in the Konenkov museum in Moscow which is housed in his old studio on Tverskaya. Konenkov won numerous Soviet period awards such as the Order of Lenin, the Peoples artist of the USSR and he remains one of Russia's most important and admired sculptors of the 20th century. This fine portrait of Mary Flexner is a rare example of his work to be found outside of a Russian museum.